As [Jesus] was speaking, the teachers of religious law and the Pharisees brought a woman who had been caught in the act of adultery. They put her in front of the crowd. "Teacher," they said to Jesus, "this woman was caught in the act of adultery. 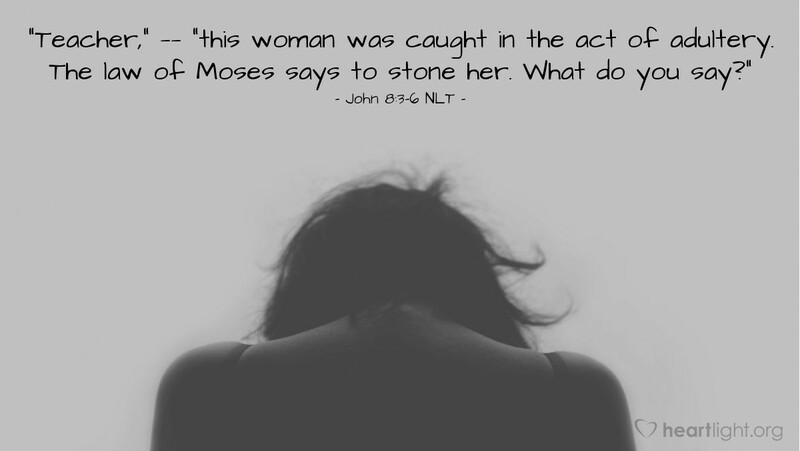 The law of Moses says to stone her. What do you say?" They were trying to trap him into saying something they could use against him, but Jesus stooped down and wrote in the dust with his finger. This situation was, of course, a trap set for Jesus. It involved a religious question intended to take the compassion of Jesus and use it to crush him against the law of Moses. It's funny how we can get so ramped up about our religious discussions that we lose sight of the heart of God. God is a God of holiness and integrity, righteousness and steadfast love. The two pairs go together. They are inseparable. Those who call upon his name as their God must pursue his character with all their heart, soul, mind, and strength. The religious leaders here remind us how easily we can shift from being righteous students of God's teaching into being vicious brutes pursuing self-justification. Lost in the argument and the pursuit of Jesus was the personhood of the unnamed woman. She is no more than a token to those who took her to Jesus, the bit of cheese on their religious mousetrap. However, even in the midst of those who hate him and would trap him, Jesus finds a way to deflect their venom from the woman and restore her dignity. People matter to God. Do they matter to us? O LORD, God of Israel and Father of my Lord Jesus, please forgive me. I fear, dear Father, that I haven’t treated all people as you would have had me treat them. That is especially true with some people who didn't fit into my religious comfortability, I haven't treated them as you would have had me treat them. Please give me a more compassionate heart to better say and do the redemptive things in the lives of those who need your grace. In Jesus' name, I pray. Amen.